This one appeared in our September 2004 newsletter and now in The Blue Ribbon Edition, our third cookbook. Adam wrote back then that research shows cinnamon lowers blood sugar by making insulin work more efficiently, and that cinnamon may also lower cholesterol. He wrote that the noted naturopathic doctor, Bill Mitchell, saw impressive results with his patients’ cholesterol when they took ½ tsp of the powdered spice twice a day. According to Ayurvedic principles, cinnamon helps diminish wet conditions in the body such as a runny nose that accompanies a cold. 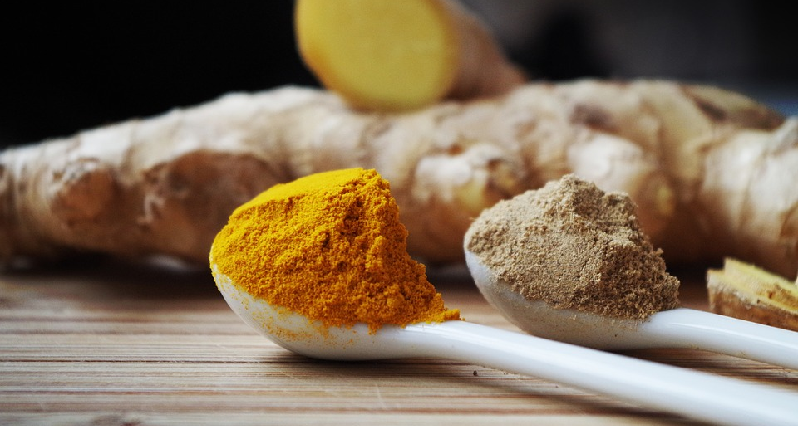 Turmeric is touted in Ayurveda (and elsewhere) as an antioxidant and anti-inflammatory. Ginger is said to improve circulation, and we all know ginger is the first thing we think about for nausea. Did you know it’s also said to be good for nervousness? And who isn’t nervous going back to school or heading to a new job? Enjoy the ghee or coconut oil! Don’t worry about these fats. According to Ayurvedic medicine they’re not stored like other fats, but boost energy and endurance, support thyroid function and increase metabolism. They also are said to improve absorption of fat soluble vitamins, minerals (especially calcium and magnesium) and amino acids. Make toast on any chilly morning. Take a minute to enjoy. Using a fork, combine honey or maple syrup with ghee or coconut oil and all spices until well blended. (Both ghee and coconut oil can be kept at room temperature. When they are, they are soft and easy to mix with other things.) Spread the spiced butter mixture on the toasted muffins or toast and serve with a mug of your favorite herbal tea or warm milk (of any kind) with another sprinkle of cinnamon. Note: Enjoy every lip-smacking bite! You might want to serve with a glass of kefir or two soft-boiled eggs. How about with half a grapefruit or a bowl of berries? *Of course you can substitute gluten-free English muffins or bread if that’s what floats your boat.